Well, here we are, in the heart of another long summer. It's Independence Day weekend, so it must be time to find a local patriotic display and eat some "All-American" foods. What's more American than Ice Cream, right? In the past, we in New England were blessed with a multitude of locally-owned shops and small chains, some of which had regional or even national prominence. But over time, that's slowly eroded, and now you'd be hard-pressed to find a local ice cream shop. Waltham has Lizzy's on Main Street, and Pizzi Farm, but the one I used to walk to is long gone and the site is full of houses nobody can afford. The Globe has a brief slideshow concerning the 20 best ice cream shops in the region. My old fave Richardson's clocks in at #6. We are a strange lot, us New Englanders. You'd think someplace like Florida, or Texas, or California would eat more ice cream than us, but you'd be wrong. And it's inevitable that at least once every winter, the Globe features a photo of some youngling all bundled up in the snow eating an ice cream cone....but I digress. Ignoring the calendar, which showed the beginning of the month of July, a dusting of snow fell Thursday on Mount Washington in New Hampshire, startling tourists and forcing the closure of the road to the top. "It's not extraordinary, but it's definitely interesting," said Stacey Kawecki, a meteorologist for the Mount Washington Observatory. Mount Washington, the Northeast�s highest peak at 6,288 feet, has recorded snow in every month. The last time it was recorded in July was 2007. The snow fell from about 8:30 a.m. to 9 a.m. and then from 10 a.m. to noon, Kawecki said. It was "about 35 degrees and there was a thick and soupy fog. Visibility was about 100 feet and ice was starting to form on the windows. Then I saw big, fat, floppy flakes hitting the windows," Kawecki said. Ah, but we will get serious for just a minute today. The North Atlantic is a long way from the Gulf of Mexico. I checked the map; it's over 1500 miles to drive from here. Even if the oil gets into the loop current and rounds the Keys, we've got little to worry about around these parts. Unless you're a plover. Piping Plovers are a comical little bird. They skitter around the beach, looking for worms, bugs, and other things to eat on legs that look cartoonishly large for them. Once on the brink of extinction, their nesting sites have been protected for years along the Massachusetts coast, and they have ever so slowly taken a step back from the brink. Except that once the breeding season is done, they migrate to the Gulf Coast to spend the summer. There might be hundreds of these fragile birds that won't be coming back next year. Now, the oil spill in the Gulf of Mexico appears to be the tiny white bird�s latest nemesis. Plovers are beginning to fly south as part of an annual migration to gulf shores now fouled with oil. Two weeks ago, bird specialists found the season�s first two piping plovers on the remote Chandeleur Islands off Louisiana, where oil has already washed up. 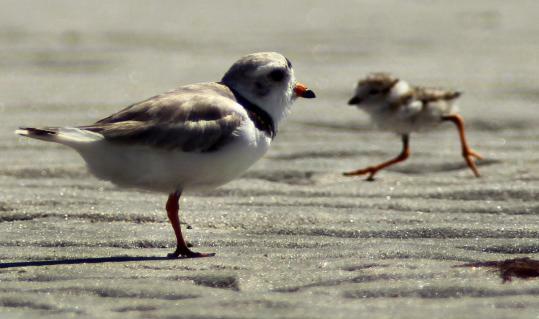 More birds will arrive in the next month and stay on gulf beaches through the winter. The bird is the latest in a series of New England species � bluefin tuna and sea turtles are others � whose populations may suffer because they spend part of their life in the gulf. Unlike seabirds that spend most of their time in the water, piping plovers prefer the shore and are best known for their short bursts of running in the flat, muddy area between the high tide mark and the water line. Specialists fear some may become coated in oil that washes ashore, but they are also concerned the birds� food source � tiny worms and other marine life � may become polluted and, in turn, poison the birds. Once, piping plovers were common along the Atlantic Coast, but they were heavily hunted � along with other shorebirds � for their feathers, used in hats. Protected in 1918 by the Migratory Bird Treaty Act, the birds� populations rose through the 1940s, but after World War II began declining again, in part because development ate up areas where they nested.